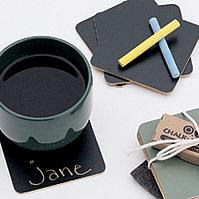 Chalkboard paint covered coasters! From Beau-Coup (source) or you can just buy some inexpensive ones and paint them yourself. How great for a lady's happy hour on the deck or even just your daily dinner with the family! If you really want to add some unique "icing" to a home office or family resource wall... how fun is this!?!? 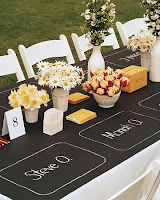 It would take some patience to tape off all the squares and mix up a few different shades of chalkboard paint, but the look is FANTASTIC! Sure beats a free sales calendar thumbtacked to the wall!